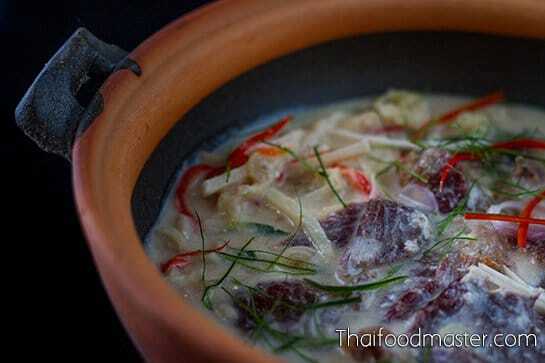 กุ้งแนม” หรือ “กุ้งซ่อนกลิ่น – Goong naaem (goong saawn glin) according to the 1908 recipe in Lady Plean Passakornrawong’s “Maae Khruaa Huaa Bpaa (ตำราแม่ครัวหัวป่าก์)” cookbook. Flaky acid-cooked shrimp and the pork fat, along with thinly sliced roasted peanuts and very small unpeeled diced bitter orange (ส้มซ่า som saa), plus paper-thin slices of pickled garlic and julienned fresh red long chili peppers are mixed and seasoned with shrimp tomalley dressing. It is served in wrapped squares, using iceberg lettuce and young thaawng laang leaves. แกงต้มกะทิเนื้อโคเค็ม – In this dish, umami-charged, salted sun-dried beef is gently grilled over charcoal, adding smoke and caramelized elements that emerge in the core of the flavor profile, alongside the umami and the savor of fat. The meat is then cut into bite-size pieces, and slowly braised in thick coconut milk. The coconut fits perfectly onto the triangle of umami, fat and smoke. It brings its own umami and fatty shades, and introduces a rich sweetness that pairs seamlessly with the caramelized character of the grilled beef. The braising also rehydrates the beef and softens it. Bamboo shoots, shallots, galangal, lemongrass and kaffir lime leaves are added, perfecting the dish with a complementary sweetness, echoing the umami hues, and cutting citrusy notes while creating hidden astringent layers. The dish is finished with fresh chili peppers and hair-thin julienned kaffir lime for a fresh aroma and piquant bite. 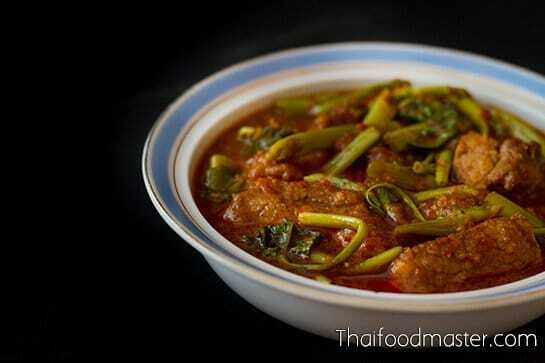 แกงหมูเทโพใส่ผักบุ้ง – Thae phoh curry is a spicy and salty Thai red curry with sour-sweet flavor shades. Thae phoh falls into the category of the gaaeng khuaa (แกงคั่ว) style of Thai red curries, as it contains no dry spices except white peppercorns. Instead, smoked dried fish meat is added to the red curry paste to accentuate and widen its umami-smoky savory flavor base. 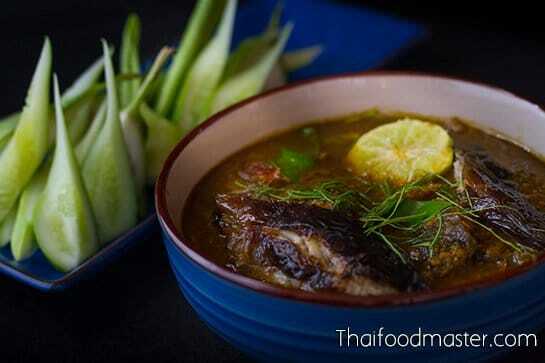 แกงไตปลาปลาดุกย่างโบราณ – Fermented fish innards curry is a dense curry made of fermented fish innards is dark coffee-brown in color – a salty, fiery hot dish, it grips the palate in an intense umami embrace. 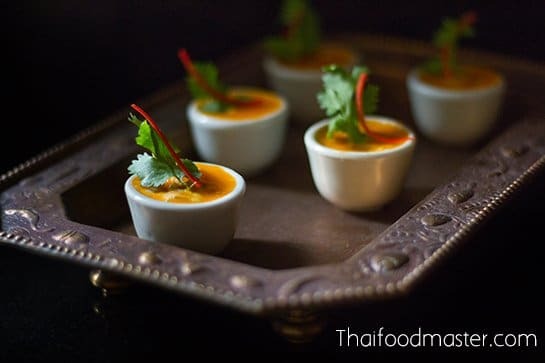 As the flagship dish in the repertoire of spicy southern Thai cuisine, it comes in different versions: some are water based; some have a base of coconut cream. But whatever the style, it is a fiercely hot dish that features both dried and fresh chilies. 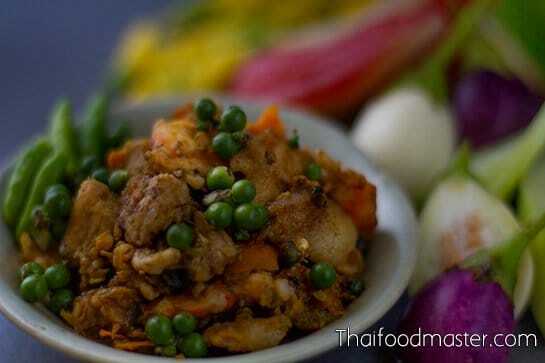 Maa ouan is a Thai appetizer with clear Chinese characteristics. It resembles the filling of khanohm jeep dumplings (ขนมจีบ), the crab and pork meat fillings of haawy jaaw (ฮ่อยจ๊อ), or the shrimp and pork meat mix of haae geun (แฮ่กึน). Minced pork and shrimp meat are seasoned with garlic, coriander roots, white peppercorns and salt, then mixed with duck egg and a bit of coconut cream, placed in small ceramic cups (thuay dta lai, ถ้วยตะไล), and steamed. It can be served either as a starter, an hors d’oeuvres, or even as a side dish to curries. 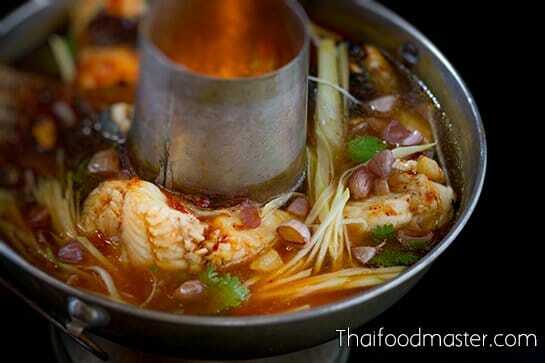 Tom yum soup from the late 19th-century Siam to present days. Including a step-by-step recreation of tom yum soup with snakehead fish (dtohm yam bplaa chaawn, ตัมยำปลาช่อน) as recorded by Maawm Sohm Jeen (Raa Chaa Noopraphan) (หม่อมซ่มจีน, ราชานุประพันธุ์) in her book “Tam Raa Gap Khao” (ตำรากับเข้า), published in 1890 (2433 BE, 109RE). Studded with small green peppercorns that burst with a mild peppery pungency, this relish is not as spicy as one might expect from a Thai chili relish – nor does the sour taste serve as a noticeable flavor pillar. Instead, a warmer and softer peppery bite, coupled with the aroma of young pepper, delivers a complex kick. The peppercorns, together with the flavorful yellow chilies, wrap the pork’s natural umami and fatty characters and enhance its natural sweetness; this sweetness, despite being placed far in the back and only appearing at the end of each bite, is nicely layered by the use of shrimp meat and palm sugar. 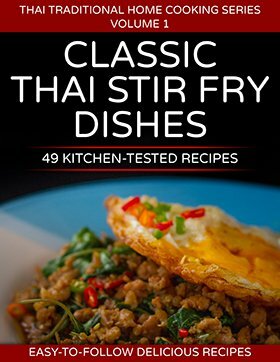 Subscribe to our newsletter that will keep you up to date with stories and events taking place at Thaifoodmaster! We will keep you up to date with events taking place at Thaifoodmaster!